SOLUTIONS TO YOUR NEEDS MAY BE MORE WITHIN YOUR REACH THAN YOU REALIZE! 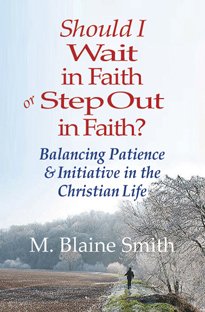 In this short book (71 pages), Blaine Smith stresses that we Christians too often fail to take needed initiative toward meeting our needs, solving problems, and pursuing goals and dreams. We assume faith requires us to wait passively for the Lord to provide. Yet so often we would show greater faith and trust in Christ by taking initiative. We would find ourselves happier and more successful by being active, and would contribute more to the mission of Christ. Smith explains why, and he offers a simple principle for deciding when to wait or initiate, based on how people resolved this question in Scripture. • We are more capable of finding good answers to our problems and needs than we imagine, because of how God has fashioned our mind and influences it. By continuing to strive for solutions, we’re sometimes surprised by sudden, welcome insight. • Doing something toward a need, no matter how mundane, usually beats doing nothing, and opens us to God’s greatest blessings. • During our lifetime most of us experience a number of blatant opportunities which God doesn’t wish us to accept. This is an especially encouraging principle to understand, for we’re not obliged to go through the wide open door if it doesn’t align with our long-term priorities. • Our prayers are often more effective than we think, and we honor God by being bold and persistent with our requests. • While we’re called to “turn the other cheek,” we’re not to be a doormat to anyone’s abuse. We expected to stand up for ourselves when others treat us unfairly. And turning the other cheek, rightly understood, is a high form of assertiveness. You’ll find Should I Wait in Faith or Step Out in Faith? filled with practical advice and encouragement, to help you find answers to your needs and to realize your highest potential for Christ! Note: Chapter 6 of this book, “Faith and Assertiveness,” and part of chapter one are adapted from Blaine Smith’s “Overcoming Shyness.” The other five chapters are published here for the first time in book form. M. Blaine Smith, a Presbyterian pastor, is author of many books, including Knowing God’s Will, The Yes Anxiety, and Marry a Friend. He is director of Nehemiah Ministries in the Washington , D.C. area.